"Translite" is the term given to the semi-transparent, rigid plastic display pieces typically seen back-lighted above the menus of fast food restaurants. 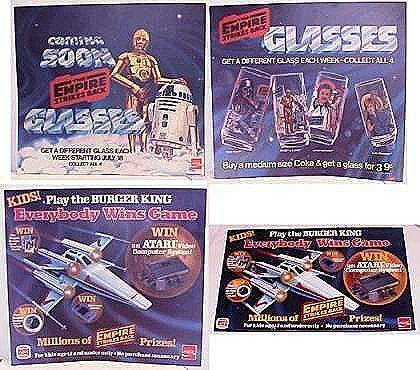 As the principle fast food licensee during the vintage Star Wars years, Burger King issued several translites, most of which promoted their well-known line of Trilogy collector's glasses. Translites are today heavily sought after by display collectors, many of whom have been trying to complete sets of them for years. Pictured above are 4 translites from the ESB era. The above two obviously plug the glasses, but the lower two signs are devoted to a Burger King sweepstakes, one of the prizes of which was an Atari 2600 game system. If you look closely at the two "Atari" translites, you'll notice that they differ in both size and design. This is because the piece on the right is a smaller version used in the restaurant's drive-thru areas.